At Liahona Academy we practice an eclectic approach in our therapy programs, meaning we tailor our therapeutic approach to the specific needs of each individual student, calling upon the "right" strategy that works. We are a relatively small academy and thus we are able to treat each child as if they were our only student. We personalize the treatment plan of each student in order to address their unique issues. Each student is different, and what they will respond to is different. Therefore, we take the approach that will be most effective for each individual. We offer individual and group therapy just like everyone else. However, our overall therapy program is delivered much different than other residential treatment centers. Beside being ecletic, we also utilize a "team approach" to therapy. At Liahona Academy the treatment team includes the therapist, the clinical director, the academic director, the program director, as well as the case manager. Included in the team approach are the supervisors and lead staff who spend a great deal of time with the students. We use the "team approach", to provide therapy within each aspect of our program. This helps each student to receive the type of treatment that works best for them. 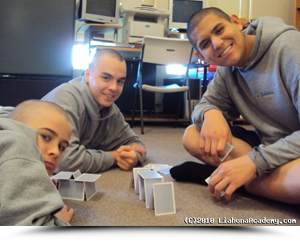 Moreover, we practice experiential therapy, which is most effective for troubled boys. Experiential treatment is a "hand's on" approach where there is a great deal of real world activities (recreational, leadership, community service, athletics, fitness, etc.). Experiential therapy is an effective "team approach" that we utilize to accomplish our overall purpose which is to help students; rebuild inner strengths, overcome emotional and behavioral problems, and develop good communication and problem solving skills. As stated before, boys respond very well to "experiential" therapy, which is much different than traditional "talk therapy". When boys are willing to participate in therapy good things can happen. Boys also respond better to the "team" approach, meaning they become very involved due to the team (family) enviornment. Boys also respond well to our team approach. The team approach means that everyone works together, both staff, students and parents, integrating all elements of the program into one team effort. Everyone is responsible and participates. Our students improve by "doing" therapeutic interventions (participating in the therapeutic endeavors), which requires a "hands-on" approach with active voluntary engagement. Essentially, our students enjoy the therapeutic approach offered by Liahona and become willing participants in the restoration process. Individual Therapy is provided to help the boys recognize greater insight into their behavior and give them an opportunity to establish a relationship of trust with their counselor. In this private setting, our students are able to discuss issues that may be too sensitive for them to reveal to others in a group setting. Group Therapy includes leadership training groups, special interest groups, anger management, drug abuse treatment, educational lectures, victim awareness groups, and positive peer groups. A licensed substance abuse counselor (LSAC) conducts drug abuse treatment seminars. Therapy is provided by a marriage and family thearapist. (LMST) that deals specifically with adolescents specializing in issues such as attention disorders, behavioral and emotional issues, substance abuse issues, depression, and addictive behaviors.